The Virginia Cavaliers – a team that has occupied the top position in the CB360 Top-50 several times during the past few seasons – has returned to that top spot, unseeding preseason #1 and defending national champion Vanderbilt to again sit atop CB360’s exclusive Composite National Rankings (CNR). Although Virginia (7–0) has yet to face a ranked opponent, the Cavs are one of only seven teams without a loss/tie in all of Division I baseball (among 281 that have played, as of Feb. 25). Virginia was the 2014 College World Series runner-up, after splitting two games versus Vanderbilt but losing the decisive third game in the CWS title series eight months ago. TCU also has moved up, inching past twice-beaten Vanderbilt into the No. 2 spot. The Frogs (7–1) are coming off a quality road series win over Arizona State (current CB360 #13) while the Commodores now have lost twice to teams outside the top-50 (Santa Clara and Indiana State). Florida – coming off a series win over rival Miami (current CB360 #14) – still is fourth in the CNR, the same spot it occupied in the preseason and after week-1. Current #5 UCLA and (6) Houston each have moved up a position – although the Cougars lost last night at Texas State (that result will impact next week’s top-50) – while LSU has dropped back a couple spots to 7th, following a loss last week against Nicholls State. 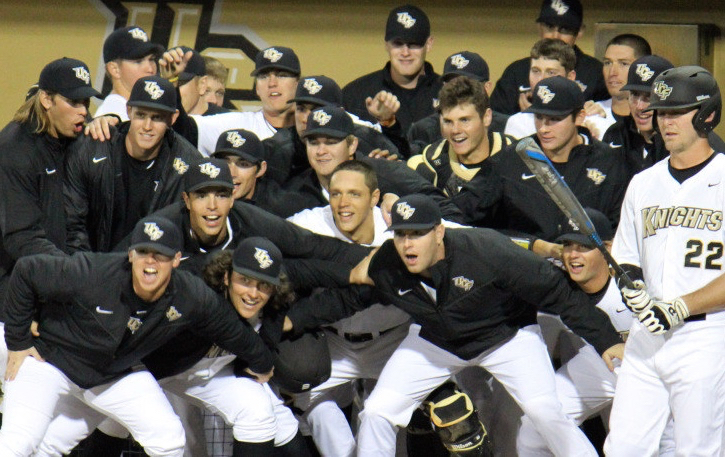 UCF has celebrated victory in all eight of its games so far during the 2015 season (photo courtesy UCF). A couple Big 12 rivals,  Texas Tech and  Texas, have flipped spots from the previous week, while South Carolina rounds out the top group by returning to its familiar position among the top-10. Louisville, after losing 2-of-3 vs. Arkansas State (in Emerson, Ga.), plummeted from 10th to 20th. Surging Central Florida, another one of the seven unbeatens, registered a pair of notable wins over the weekend in Mobile, Ala., against top foes Maryland and Arkansas. UCF opened the season 38th in the CNR but now has cracked the top-20, at 19th. On the flip side, Cal State Fullerton has slid from a preseason #16 position in the CNR all the way down to its current #44. Stanford – which won a series at Fullerton, but lost midweek on Feb. 16 at home vs. Cal – was 22nd in the preseason CNR but has slipped to 44th. Tulane … won at Southeastern Louisiana and swept 3-gm home series vs. San Fran. (Note that the current CNR formula was adjusted somewhat, due to the coaches poll not being updated since preseason. That poll still was factored into the current CNR but only at a 50% value compared to the other polls, which are updated through week-2. As a result, the baseline for the CNR this week is 36 rather than 40). Note: the following teams dropped out of the top-50 after being in the preseason CNR: (42) Kent State, (43) Wichita State, (46) Ball State, (48) San Diego and (49) Kentucky (also #50 Dallas Baptist, which now has returned to the top-50). I love these rankings, great job! But Tulane is in the American conference, not C-USA….